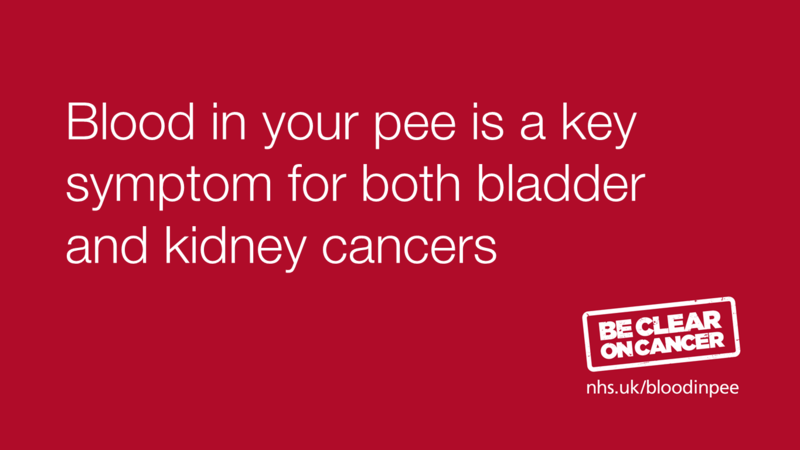 Today we launched a rerun of our national Be Clear on Cancer campaign that highlights blood in pee as a key symptom for both bladder and kidney cancers. The key message from this latest campaign, which is aimed at men and women over the age of 50, is to encourage anyone who notices blood in their pee, even if it’s ‘just the once’, to visit their GP to get it checked out. The campaign is aimed at this particular age group as between 90-97% of bladder and kidney cancers diagnosed are in people in this age range. Most people may not spot blood in their pee unless they check, so this year’s campaign also highlights an additional message: “Look before your flush”. This is particularly aimed at women, who may be less likely to do so. So who is most at risk of bladder and kidney cancer? How many people are diagnosed with bladder or kidney cancer? Around 17,450 people in England are diagnosed with bladder or kidney cancer every year and around 7,600 people die annually. Blood in pee is a symptom in over half of bladder cancers and almost a fifth of kidney cancers, so being aware of this is important. As with all cancers early diagnosis increases the chance of survival. If diagnosed at the earliest stage (stage 1), the chances of surviving five years or more can be as high as 84% for kidney cancer and 77% for bladder cancer. However, if diagnosed at a late stage (stage 4), survival is not good with only 10% for kidney cancer and 9% for bladder cancer. This latest campaign builds on the success of previous Be Clear on Cancer ‘blood in pee’ campaigns, which ran nationally in 2013 and 2014. Data from the 2013 campaign showed that 18% more people visited their GP with blood in their pee. There was also an increase in bladder and kidney cancer diagnoses resulting from an urgent GP referral for suspected urological (related to the male and female urinary tract system and the male reproductive organs) cancers by 8.2% and 22% respectively. Also an analysis of diagnosis during the 2013 campaign shows a significant increase in early detection which equates to the prevention of around 70 bladder cancers and about 25 kidney cancer deaths. It is vital that we all do what we can to raise awareness that blood in pee could be an early sign of bladder and kidney cancer. It is possible that people don’t always think of visiting their doctor if they spot blood in their pee, this could be for many reasons – such as they think it may happen just the once, or may pass the symptom off as cystitis. The key message is - don’t wait to see if it happens again, go and visit your GP straight away.